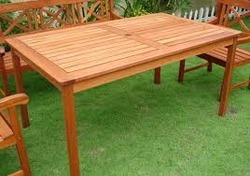 Our collection is distinguished by its simple , solid design suggestive of traditional woodworking techniques.These outdoor wooden furniture are constructed for weather resistance and lasting style. Cushions are water - repellent ring-spun polyester canvas. 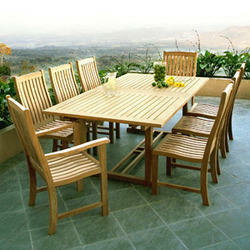 In order to fulfill the changing demands of our clients, we are offering Outdoor Wooden Table. The offered products are specially designed by the creative experts keeping in mind the diverse needs of patrons. Available in stylish designs that suits the requirements of clients.